Hardscape refers to the nonliving parts of your outdoor space. Built elements such as surfaces, walls, fences, sculptural elements, trellis & structures such as pergolas and sheds. Why you should consider Gardenalia for your next project? Hardscape refers to the nonliving parts of your outdoor space they are built elements such as surfaces, walls, fences, sculptural elements, trellis and structures such as pergolas and sheds. What stands Gardenalia apart from our competitors is our talented team. Gardenalia as a design firm is robust with talent and skill our designers hold professional degrees in landscape architecture, garden design and art, providing the knowledge for up to date construction standards. Gardenalia’s design team’s education is backed by the experience needed for them to be incredibly inventive. locally sourced, eco-friendliness & sustainability. In keeping with Gardenalia’s core values of eco-friendliness and sustainability our team uses locally sourced materials whenever possible which reduces carbon footprint. Our stone is hand dug in the Allegheny mountains and hand cut to specification. The close relationship we have with our local vendors allows our team to hand craft your design outcome. We have experience working closely with customers to re-use elements from their own garden or visiting places like Construction Junction if the customer also wants this approach. Garden elements are what make the landscape functional this is where education and experience are essential, while you may know how you want to use your outdoor space our design team has the ability to ensure your garden elements have functionality you desire while being surrounded by a beautiful native landscape that blends seamlessly in with the greater landscape. Gardenalia specializes in designs that reflect a Pennsylvania landscape which creates a low maintenance and sustainable situation. Garden elements are easy to envision but challenging to strike the right balance this is where the Gardenalia’s team excels, we love and have years of experience working within the complexities of challenging existing spaces. The topography of Pittsburgh provides our designers with challenges relating to hillsides, wildlife, difficult soil condition, hydrology, the proximity of neighbors in an urban setting, access to sunlight. What sets Gardenalia’s apart is our team’s ability to see opportunities within these challenges for example rain gardens were there once was challenging soils. Waterfalls and dry creek beds where someone may have faced storm water issues. Our designers specialize in considering the elements of urban living using salt tolerant plants in beds that are close to roads and maximizing the ability to use the “Pittsburgh postage stamp yard”. We recognize that green space for nature play for children is essential and shrinking, mature play is critical for healthy development and unstructured outdoor play is key element. Which is why Gardenalia like to include whimsical touches to the garden from intentional play structures or whimsical touches such as a rope ladder on a climbing tree? 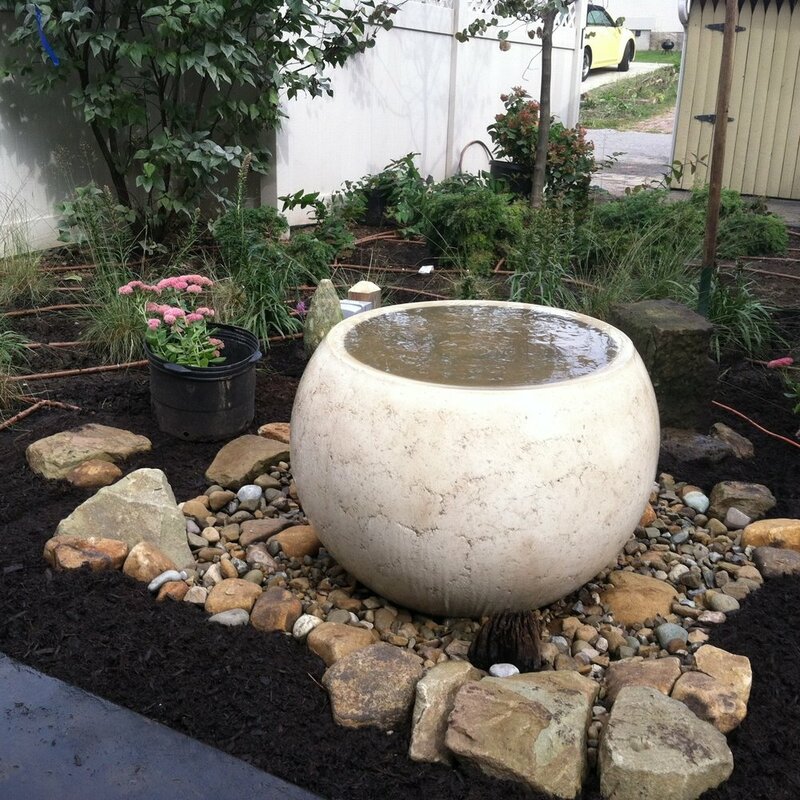 Why Garden Elements are a part of the balance of good landscape architecture because there is benefit to making native plants using local native boulders and hardscaping gives the organization and structure to balance the natural shapes present in the garden design.